Hi Quick Quotes fans! Dana here today sharing a winter canvas. I used the NEW Metal Embellishments as the focal point of this piece. I started with a 5x7 Blank Canvas Panel. I colored the background with Blue Jeans, Caribbean Blue, Coconut White and Feather Gray PowderPuff Chalking Ink. I rubbed Creamy Cocoa PowderPuff Chalking Ink around the edge of the canvas. 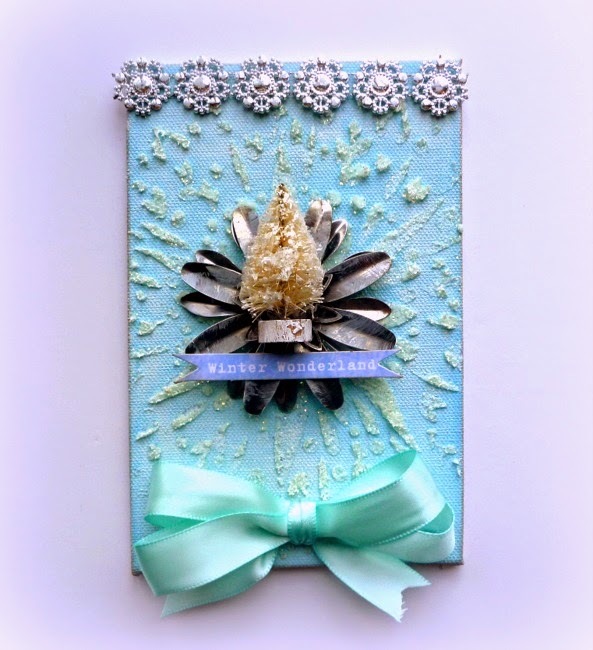 I then added the snowflake pattern to the canvas using a stencil and Martha Stewart Sparkle Texture Effect. I glued two Metal Embellishments together onto the center of the canvas and then topped it with some festive embellishments. I went over the embellishment cluster with a light coat of gesso. I finished the canvas with some metal trim and ribbon from a past Club Q Kit.